Many people see the calendar not as linear but circular; a Wheel of the Year, forever turning and coming back again full circle to the beginning. We know that our ancestors observed festivals at certain times of the year, although there’s little written evidence as to how they celebrated. We do know that the four ‘fire festivals’ were marked: the summer and winter solstices, and the spring and autumn equinoxes. Many sacred sites all over the world have stones aligned to the sunrise or sunset of these four solar events, which would have been pivotal points of the year in terms of light and darkness. 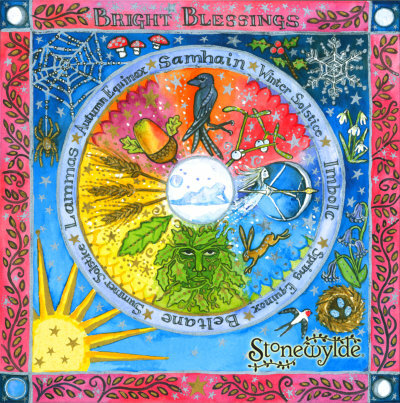 Four important farming events were also marked in the Celtic calendar, and these are known as the ‘cross-quarter festivals’ – Imbolc, Beltane, Lammas and Samhain, although the names can vary according to source and region. By their nature, the folklore of these festivals is rooted in local custom. There’s no doctrinal tract that states how they must be celebrated, no set of rules or rituals that must be adhered to religiously. Customs have been handed down through the centuries, and others have been newly invented or discovered. Morris and Maypole dancing are good examples of old customs that have been revived, although their origins and details are long obscured. There are many lovely ideas about how to celebrate the eight festivals in a little book called ‘Sacred Celebrations’ by Glennie Kindred. It’s also a good idea create a little ‘nature’ table to mark the season and focus on objects that have special meaning, be it an acorn or a snowdrop, a stone or a seashell. Lighting a candle is always a great way to focus your attention, staring into the flame and concentrating on positive, affirmative thinking. Beautiful scents and music can heighten the senses’ perception, and many people like to eat and drink something to acknowledge the bounty of Mother Earth. If possible go outside into the open air for a meditation, still or walking, especially at sunrise or sunset. The best way to be in touch with the beautiful natural world and the changing seasons is to spend time out of doors, surrounded by nature in all its glory. There is more information on each of the eight festivals and also the full moon on the menu button. The image shown here is from a greetings card (available in the Stonewylde shop) designed for us by Helixtree, and is subject to copyright. On the image, click on on the festival you’re interested in, to jump to more details.